David Foster Wallace had a meteoric rise to the top of literary American fiction in 1996. He went from a published, if little-known, novelist and college professor to 'the guy' who was on the cover of magazines and in the minds of young readers, writers and cultural critics. "Infinite Jest" with its sprawl and footnotes and obscene amount of popular culture references was greatly admired and hailed as the new, great, thing immediately upon publication. And that alone would send almost any writer into an orbit of happiness. But Foster Wallace was not most writers. He was a highly self-critical person and one who dealt with the extremes of depression for nearly twenty years. Age-wise, I'm right in the wheelhouse for most of the huge DFW fan-boys. Yet while I knew of him and had lots of friends who were massive admirers I just never got around to reading him. I finally took on the massive "Infinite Jest" in the summer of 2007 and admired it and was confused by it. Later on I did read some of his short stories and read some of his essays--though many of them were, frankly, just too smart for me. Even though I never *got* all of his stuff, I was saddened greatly to hear of his suicide in 2008. 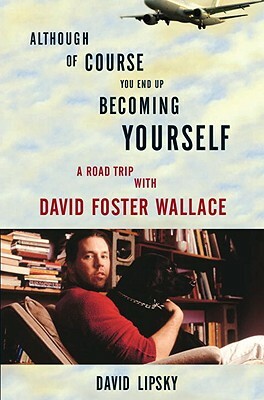 David Lipsky travelled with DFW for five days on his reading tour for "Infinite Jest" to write a piece on him for Rolling Stone. The piece never ran--but the book "Although Of Course You End Up Becoming Yourself" is Lipsky's story about those days. It reads, at times, like pure transcript because that is what is. But the reader soon gets into that rhythm. What is apparent is that these two men bonded over things--music, movies, books and nicotine. Wallace comes across as wildly bright and down to earth. Inquisitive and imaginative and, ultimately, quite sad. I think it was a smart idea to publish the book in a paperback original($16.99) and while it probably isn't the best place for someone to start with DFW it is great for fans. It shines a light on one of the brighter writing stars of the last twenty years and shows, in part, just what might have been. Like all suicides, the questions will always far outweigh the answers. But in this book Lipsky has given readers something to smile about.